LAU LAU BEACH (S) - With an easy beach entry and one of the largest reefs on the island, this is one of Saipan's the most frequently visited sites. 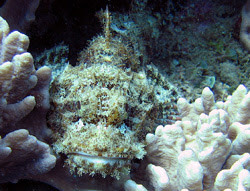 Lau Lau has an array of Wrasses, Butterfly Fish, Surgeons, Snappers, and more. At times large balls of Big Eye Skad hang out just outside the the cut in the reef. 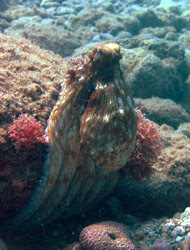 For the diver that likes to go slow, you will also have frequent encounters with nudibranchs, scorpionfish, and octopus. This is an ideal dive site for beginners and if you do your SCUBA certification in Saipan you will most likely end up doing at least one or two dives at Lau Lau. For people interested in smaller, more colorful animals Lau Lau is an ideal site. 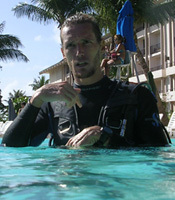 You can stay shallow and get dives in that will last over an hour or two if you are good on air. 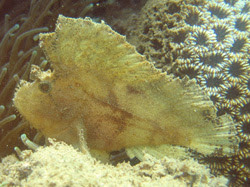 If you look closely you might even find a Leaffish, a Helmet Gurnard or a Banded Snake Eel. Lau Lau's Big Eye Skad (Atulai) - This is a little clip of the largest school of Atulai I have seen at Lau Lau to date. This video was taken last year with my crappy camera, but it is still pretty impressive. The dark areas you see on the background are more Skad. The Skad are out there right now and the school is growing steadily. Go check it out!